Up to the Light, in association with the DBA, conducted 455 telephone interviews with design clients to produce the What Clients Think 2017 report. It’s an interesting an insightful read for anyone in the industry. 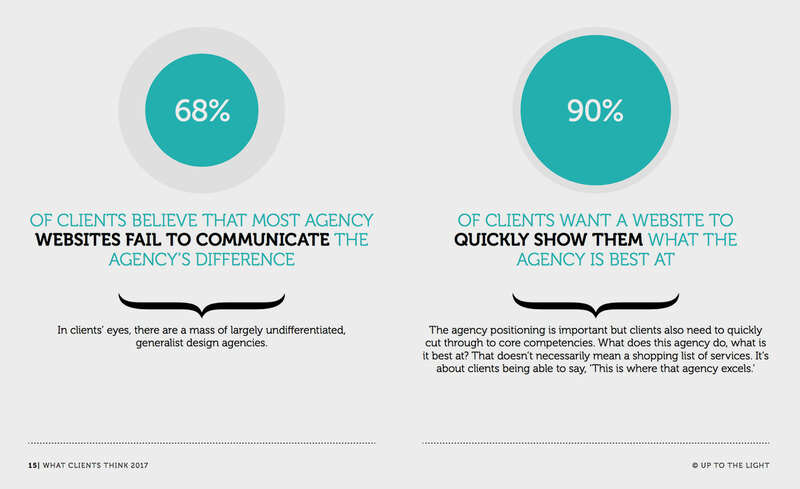 The first thing that stood out was that most clients don’t actively follow their designers on social media. I can breathe a sigh of relief here as I’ve always been a bit lazy with updating the BVN accounts, but if we were to focus on one social pipe, it should be LinkedIn. That’s where our clients are, and that’s where they will see our business updates. ‘Business Development Managers’ can potentially be a turn off. I’m not sure I agree with this one. I’ve won clients based on our website, and from time to time a client would bring up a recent blog post or portfolio piece in conversation. But I do agree with this one. Our websites are just as good as our branding services, and vice versa. Download the free report from Up to the Light.